It won't be long until the Mini Mes, like your children, say farewell to their teachers and break up for summer. If you are dreading the expense of day trips and holidays you can always save the pennies and have fun at home instead! Children are fascinated by these and have great fun blowing, chasing and popping them. If you don't have any mixture to hand you can easily create your own with washing up liquid and a splash of water in a bowl of bucket - you can even make glow in the dark versions! Try making your own wands from utensils at home to make some weird and wonderful shapes! Make the most out of the gravel and stones by turning them into masterpieces! Rearrange them to make dragons, princesses or maybe a family portrait. If you have some paint or pens you can try our simple Rock Pet activity too. With a splash of water you can soon transform your mud into messy play and whip up some worm filled wonders like cakes and pies! This is a great sensory activity - get some sticks and leaves involved too. With some black bags and imagination (or rolled card and tissue paper) your little ones can get creative and make a wind sock in no time at all - giving you time to sit back on your deck chairs for 5 minutes as they keep themselves occupied. If you don’t have any garden furniture and you need something to relax in this summer, then have a look at Internet Gardener’s rattan garden sofa page. Making fatballs and homes for bugs is great fun and helps to teach children the importance of looking after wildlife. You can always buy one if you don't have the time, but the kids will still spend many a warm afternoon watching the insects flying in and out. Ask them to draw some pictures too! Just eating alfresco can be a mini adventure for little ones. We often take our food outside with a blanket, a collection of bears and a few books to enjoy some fresh air together. You can do some drawing or colouring while you are outside and even some jigsaws or games for a change of scenery. Using some kitchen roll tubes and some paper plates you can easily create a garden game of your own. Stick the tubes into the ground and cut out of the centre of the plates to use as your hoops - quick and easy and great for developing hand-eye coordination. We have also used glow sticks for a night time alternative! Take it in turns to hide items in the garden and make a map so others can find the missing treasure! For older children you can make cryptic clues or for added fun have a pirate themed day where you can dress up and provide a themed lunch too. Water play and more water play here! my son loves a picnic in the garden. We do it after school if the grass is dry. 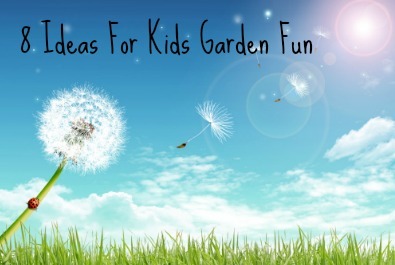 Some great ideas to keep the children entertained outdoors! Bubbles are always a favourite and the treasure hunts sound great, in fact all the activities are low cost and fun - thanks for sharing your ideas for outdoor fun on Country Kids. lots of great ideas - my kids love a treasure hunt! We love planting in the garden especially Lavender it smells beautifull when you walk past it. I used to like bubbles as a kid. Great ideas especially with summer on the way. My son loves watering the plants in his patch! Great post and has given me some more ideas of things I can do with my little boy in the garden. He also really enjoys helping me in the garden whether it helping me to plant things or to help me water in the garden. We love picnics and work off the sausage rolls by holding a mini olympics.